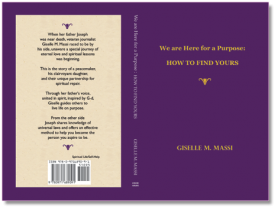 “Seeking your purpose, living it, requires you become a spiritual warrior,” my father says. “You must overcome or transcend the strong forces of adversity that exist, the obstacles to peace, that people succumb to a great many times in their soul journey. “These forces of adversity and challenge actually build self-knowledge and self-respect rather than destroy them, if met with grace and dignity. The spiritual warrior grows stronger by doing all work with mastery as the goal. “To be a co-creator of your purpose requires the strength of a warrior, strength that is developed through efficient practice, patience and focus on the path of integrity and virtue. The spiritual warrior’s battle is not with others but rather with mastering fear of judgment, whether it be external judgment from some higher power or G-d, or judgment that comes from oneself. So how does one move beyond fear of not possessing the necessary fortitude, beyond fears of failure, all the forces that fuel confusion and uncertainty? “Remember that we are not perfect,” my father says. “That’s just part of what it is to be a human being. We are imperfect as humans, and we are to accept that. There’s nothing wrong with our imperfection at this developmental level. “What matters is that the instant we recognize we have made a mistake, we are to fix the mistakes as we go. By living in this way our path becomes a practice of forgiveness, of one’s own mistakes and then of other’s. “Practicing forgiveness opens the way for compassion and a soft, peaceful heart, to emerge. As our capacity for compassion expands, so too does our self-esteem. And from self-esteem comes a love of self that helps one realize the unique and essential value for the collective soul journey. What you are passionate about is not necessarily the same thing as what your purpose is. So it is especially important to understand the difference between passion and purpose and not mistake one for the other. Passion is a relationship with something other than ourselves created through our mind and our emotions. A simple way to understand passion is to think of it in terms of desire. A passion can be expressed as an intense interest, fascination, commitment or devotion, to an idea, activity, person or object. Examples could be a passion for fitness, photography, cooking, nature, music, justice, freedom, charity, and even G-d.
Purpose is a relationship with ourselves that is created at a different level of our being. It can use our minds, emotions and our physical being to express it, but purpose is not created through those parts of ourselves. Purpose is created at the level of our soul. It speaks to that place where our greatest need for wholeness exists. 3) experience the sensation of awe. There is a Hassidic teaching that expresses quite eloquently this idea. Essentially it says that every human being possesses a distinct truth. In their lifetime, a person is to give birth to this. It is no wonder it feels like there is a weighty assignment we have to complete. The wonder is why it is such a challenge to figure out the specifics of the assignment, just what that distinct truth is and what it requires of us to bring it forth from ourselves. What is absolutely true is that our purpose will require us to be fully alive. “People are being taught to follow their passions and dreams to bring meaning, completion and happiness to their lives,” my father says. “Many people indulge themselves with those passions and do experience varying degrees of fulfillment and satisfaction depending on how much they surrender themselves to those passions. Feeling pressure by others into pursuing or following your passion or dream before you are fully prepared for the work and commitment it requires, is problematic. The consequences of doing that can be unnecessary complications, setbacks and disappointments. The popular pitches to do only the work you love and the money will flow, or to follow your bliss, may distract and delay people from realizing their purpose, he says. No doubt there are individuals who have successfully merged passion and purpose, who enjoy the additional benefit of an income from the combination. But typically, that is not what most wind up doing in their lifetime. If you find yourself returning to thoughts of what you can do to make a living, a profit, as opposed to what you can do to bring authenticity to your present situation, my father says you are missing the mark of purpose. A time to reassess what is really going on in your life is when you find yourself pursuing a passion or dream because it is a vehicle for making money. Working the three assignments in Chapter 10 will help you reconnect with the truth and remind yourself of who you are aspiring to become. There are physical places and mental spaces all of us must move through to bring our purpose into full realization. What efforts you have made personally and/or professionally up to now, as well as what you are currently doing, are all part of the process for fully appreciating your purpose. Each experience and meditation inevitably moves you closer to where you need to be. Sometimes you may find yourself in places where you thought you might never end up or in places that seem like a purgatory, a place of misery, or a time of dormancy. But even these places are opportunities for you to unearth and express your authentic self. So right now if you are thinking you are not living your life’s purpose, the reality is, you are. This truth is not something to dismiss lightly. It is a tool. Use an overview of your experiences to form an assessment of how far you have come. If you are honest with yourself, you will see momentum. Recognizing your movements will enable you to project where these experiences are likely to lead you next. In moments of self-doubt or impatience, remember what you have accomplished, and what those achievements have helped you to understand about yourself. To become the person you aspire to become is as natural a progression, my father says, as each of Earth’s seasons that bring renewal and birth. You are in a building, creative stage even when the new growth seems invisible. You can be certain you are going places. Retrain your eyes to see the distance you have gone instead of concentrating on what you have not yet covered. To become the person you aspire to become requires you move beyond limiting ways of seeing or thinking about yourself. You are required to truthfully assess who you are: what your actual limitations are, without inflating or exaggerating your abilities, or denying your strongest assets. That is how you “get real” with yourself. Whenever you hold on to thoughts that diminish the value of your capabilities or sense of worth, you are choosing to live in an unhealthy zone. People choose to believe certain limiting things about themselves so they can either remain lazy or avoid the risk of failing. Sometimes people hold on to self-defeating thoughts so they won’t have to accept responsibility to become more than they are now. When you are in these unhealthy zones you are in a form of denial. Don’t be willing to deny yourself the happiness that comes from exploring your limitations and exceeding expectations for yourself. Becoming who you aspire to become may necessitate you leave familiar places or jobs under the appropriate circumstances. Familiar surroundings, or employment that restricts advancement, frequently ends up being a false safe haven, one of predictable comfort, rather than a true sanctuary that inspires dynamic growth for your soul. When you resist making appropriate moves when all indications point in the positive direction, it is called complacency. Don’t be willing to accept stability if it allows you to be complacent. To create space for change and space for challenge takes courage and an understanding that you are a work of creativity in progress. You are the artisan refining your image. Your workshop is your experience. Widen them, vary them, move with them.